Basic good nutrition is essential for optimal development and learning in any child. Certainly, the foods that a child eats (or doesn’t eat) can affect the level of attention, energy, and overall behavior and mood. A child can also experience hunger pangs, not just from a low volume of food but also from poor nutrition. This “hunger” can lead to increase problems with concentration, irritability, and a lower tolerance for frustration. In the fast-paced world we live in today, it is often very easy for us to neglect good nutrition. As our day gets away from us, we may find that we are stopping by the fast food drive-thru for our family dinner more frequently or we may purchase pre-packaged meals to pack for our children’s school lunch. Breakfast time can be a challenge, as well, especially if you find yourself in a rush to get out the door in the morning. Children who skip breakfast or consume a high carbohydrate, low protein breakfast in the mornings may experience increased difficulties with problem-solving skills, short-term memory, and attention. Conversely, kids who eat foods that are higher in fiber and/or protein (such as oatmeal, eggs, and cheese) for breakfast tend to perform better throughout the morning. Dr. Vincent J. Monastra, clinical psychologist, researcher, director of an ADHD Clinic in New York, and author of several books on ADHD, explains more about the importance of protein: “Brain cells need protein to make neurotransmitters (which we refer to as ‘brain juice’) and without this ‘juice’ the brain simply cannot do its job. We teach our patients that foods such as cereals are like straw or kindling: They start up the fire in our brain and help us to concentrate for brief periods. However, the protein foods that we eat are the logs that keep the fire in our brain going, helping us to concentrate all morning (or afternoon).” Dr. Monastra encourages his patients to consume at least 80% of the recommended daily allowance for protein at breakfast and lunch. So remember that “fueling your child up” on protein in the morning and at lunch can help sustain their attention and focus throughout the day. Need ideas for breakfast? Learn how to cook ​easy breakfast recipes for busy mornings and try some oatmeal recipes. If your child is on stimulant medication that reduces his appetite, you may experience additional challenges just getting him to eat! When he does eat, it is important for the food he consumes to be nutrient dense. This way he isn’t filling up on junk food and empty calories. Smoothies can be a great way to boost nutrition intake for those picky eaters or kids on the go. According to the USDA guidelines, a healthy diet is one that emphasizes fruits, vegetables, whole grains, and fat-free or low-fat milk and milk products. It also includes lean meats, poultry, fish, beans, eggs, and nuts and is low in saturated fats, trans fats, cholesterol, salt, and added sugars. Be sure to talk with your pediatrician to make sure that you are on the right track in providing healthy meals and snacks for your child. 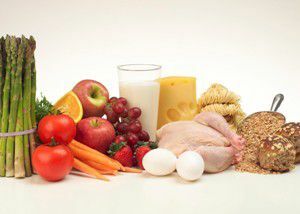 You can also use the food pyramid, to create a customized food pyramid plan for your child. A small percentage of children with ADHD have sensitivities to certain foods or food additives, such as colorings or preservatives. If you suspect your child may have these sensitivities, talk with your pediatrician. Vincent J. Monastra, Ph.D. Unlocking the Potential of Patients With ADHD: A Model for Clinical Practice. American Psychological Association. Washington, D.C. 2008. United States Department of Agriculture. Dietary Guidelines. Mypyramid.gov. 2009.